I hope you're all enjoying the weekend! We're under sunny skies and temps in the upper 70's, so all is great here! Today I've got Part II of the Zoya Fire & Ice Winter/Holiday Collection for you, and if you missed Part I you can view that here. Again, these were all 2-coater applications and I tried to show photos of each shade in direct and indirect sun, as well as in the shade. The colors don't change in different lighting, but the finish does. 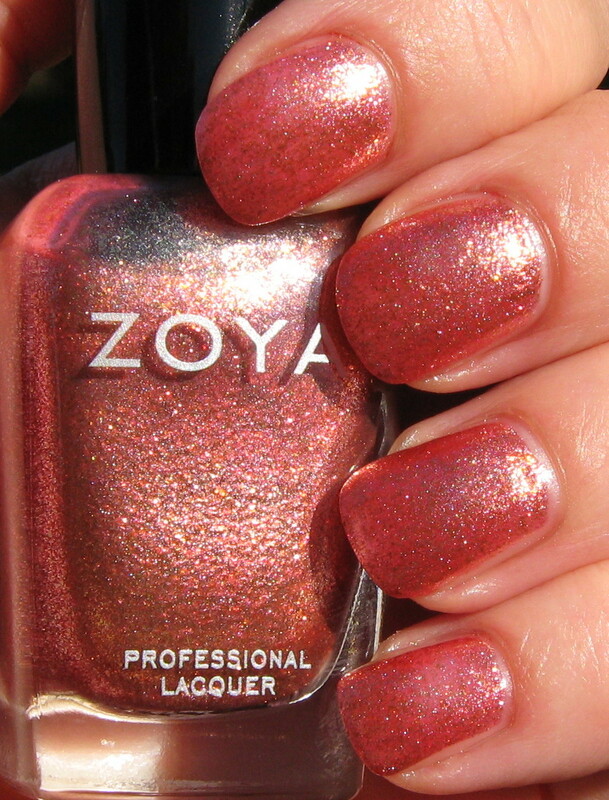 Above & Below: Tiffany is a blinged-out salmon shade with gold and silver glitter. 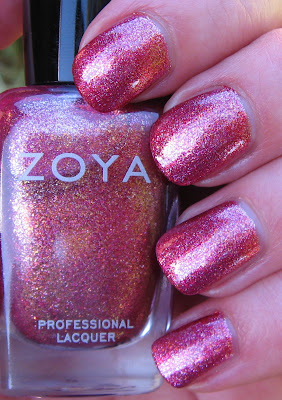 This shade is one that while fine for any season, I think would look lovely as a pedicure color on tanned toes! 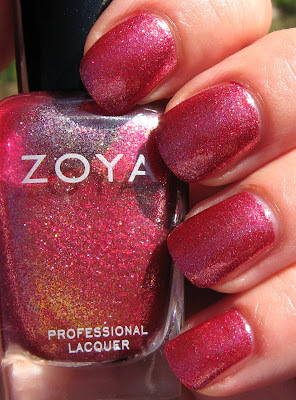 Below: Gloria is a muted light cranberry or pale burgundy shade with silver and gold glitter--I actually think all of these have glitter in their primary color as well, but they are so sparkly, it's hard to tell! Below: Crystal, a medium blue with a touch of turquoise. The gold glitter in this looks like flakes of shattered gold leaf, and is absolutely a new favorite of mine. You'll get no complaints from me on this stunning collection. The application on all six shades was problem-free, and 2 coats? Like I said, no complaining here. Most of these have a glitter finish that turns more foil-like in the shade or in lower lighting--actually, Valerie is really the only one that doesn't have that feature, but she too is gorgeous. 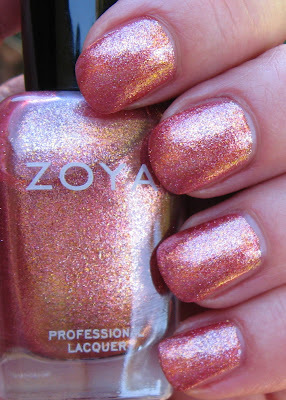 Sarah is quite a bit less foily than the other four, but I did detect a slight foil finish in that one as well. This is a great collection not only for Fall/Winter, but I can see see wearing them year-round without causing any type of fashion faux pas! Gloria is really pretty but I've never seen such a color like Crystal! they do look amazing! 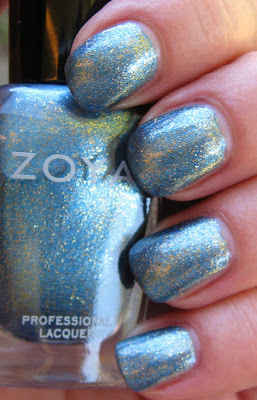 I always wanted to try Zoya! wow I love these! so pretty! 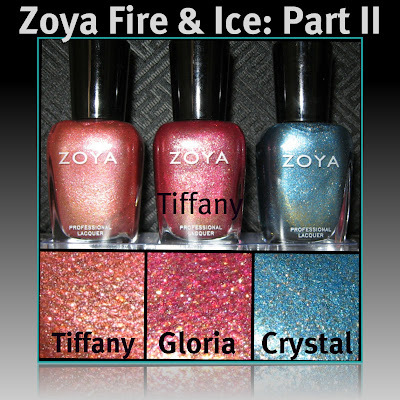 Wow, these polishes are gorgeous, really like Gloria and Crystal especially! I can't believe how beautiful this collection is... I am pretty sure I ned to buy the whole set! These are really gorgeous. I have to order these. Tiffany is very pretty and looks so beautiful on you. Your skin tone matches very well with that color on you. However, I love Crystal, it's the gorgoeus blue shade and looks amazing on you, as well. Nice job! Love your web blog! Nameste.